Obligatory public service announcement: see CivCity’s Ann Arbor Votes page for information. Here is the City of Ann Arbor’s page on voting absentee. If you are qualified, you may apply until 4:00 p.m. on Monday and vote in person at City Hall. If you’ve been living in Ann Arbor for a while and have been awake, you know that the control of the Council agenda has been the subject of a mighty tug of war. (See, for example, our post The Placemaking Agenda and Ann Arbor Politics.) Now, with the passage of a charter amendment that means all Council members will serve for four years, this is the last odd-year election and perhaps the last chance for a group of scrappy Ann Arbor residents to elect representatives who will actually represent their interests. (Note: this is a “catch-up” election. Those elected will serve for three years and then all terms will be for four years.) It is also a make-or-break election for Ann Arbor’s Mayor Christopher Taylor. Taylor has lately enjoyed a supermajority of CM who represent his vision (and that of his mentor John Hieftje). With this 8-vote majority, he is able to pass through almost any measure, leaving the minority (CM Jack Eaton, CM Sumi Kailasapathy, CM Jane Lumm) to present measured opposition in the face of overwhelming odds. The Mayor also included an anodyne list of promises, should his slate succeed. He is for fiscal integrity. He likes quality services, and a quality way of life. He likes parks. But these points are perhaps more descriptive. We also know that Ann Arbor has not yet done enough to prepare for our future — we do not have anywhere near enough affordable housing; particularly in light of the failure in national leadership, our climate change responses need to accelerate, not stagnate; and the City’s costs rise faster than its natural revenue increases, threatening the sustainability of services upon which residents depend. We share the belief that all successful cities evolve. No one can stop change, but we can and must do everything we can to ensure that Ann Arbor maintains its essential character, the character that drew us all here in the first place. Finding that mix, finding that balance, is what it’s all about. 1. More approval of high-rises everywhere. Are all high-rises bad? Of course not. They make sense in certain locations and for certain purposes. We’ve all gotten used to the student housing towers. But a major issue this year was the Core Spaces sale of the Library Lot. See our post Core Spaces and the Soul of Ann Arbor. This has been criticized on the basis of aesthetics and use of public land, but also on fiscal integrity and the loss of publicly funded parking spaces. The behavior of the Council majority in the push to approve this questionable project (there are still legal questions to be resolved and it is taller than any new building in Ann Arbor) has activated many citizens. 2. A serious push to build an Ann Arbor Train Station, on the Fuller Park site if at all possible. This project is in a terminal state right now (it is proceeding without the possibility of further Federal funding, and still no word from the FRA), but don’t give up on it. One way it could be funded would be by selling bonds or seeking private investment. This has been a top priority of Mayor Taylor from the beginning. See our post Ann Arbor and the Rail Station Gamble. 3. An increase in water and sewer rates. This is underway and goes beyond the yearly increases in water, sewer, and stormwater rates already experienced. There appear to be moves to restructure the rates. (Note that our system probably needs major upgrades if a heavy development surge is to be supported.) A survey was sent out this summer that sent some strong signals. Here is just one page from the survey. 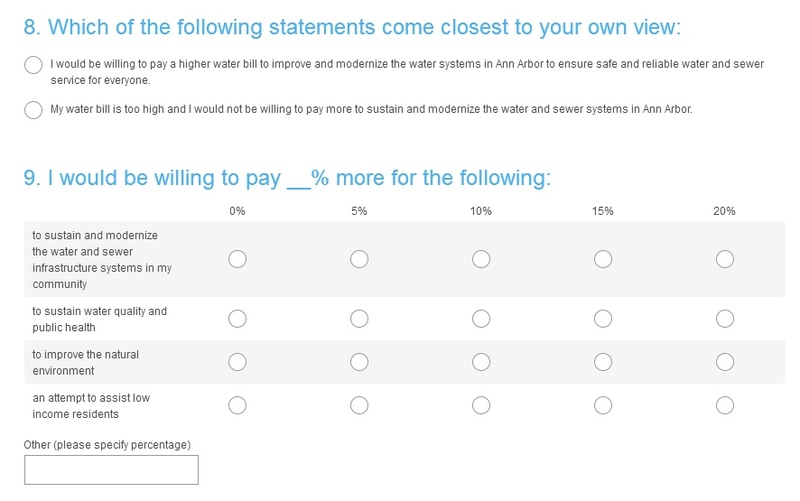 From the survey sent out by the City of Ann Arbor in June 2017. Click for better visibility. 4. An effort to find additional tax revenue. Mayor Taylor has some ambitious goals and we are constantly finding that Council is limited by the Michigan tax structure and our structural deficit (the UM occupies a great deal of what should be our tax base). The only current possible mechanism is the County millage vote (which has been arranged for a “rebate” to Ann Arbor without strings attached; see our post, Hair on Fire in Ann Arbor). Another possibility, which has been considered by Council this year, is a city income tax. (Our post, Same Song, Different Verse, laid out some of this.) Taylor’s endorsement message had this curious statement “the City’s costs rise faster than its natural revenue increases, threatening the sustainability of services upon which residents depend”. “Natural” revenue increases? 5. A move to down-zone up-zone residential areas so that more dense development is allowed in traditionally single-family neighborhoods. “Down-zoning” Up-zoning would be, for example, changing R1 properties to R3 or R4, making multifamily building more available. (Karen Hart, former Planning Director for the City of Ann Arbor, pointed out that I had this definition backwards. What I have described is “up-zoning”. I regret publishing in haste because of the pressure of the calendar without checking this terminology more carefully.) Neighborhoods near the central core are at most hazard for this. Many of those are R2A or R4C, which has permitted modest infill with 4-unit condominiums in place of a single-family house, for example. See this zoning map for Water Hill. But denser development will depend on a down-zoning up-zoning. Such a move would be consistent with Mayor Taylor’s emphasis on affordable housing. (It is a matter of faith with many urban planners that denser development would bring affordability, though to date the result has simply been more expensive condominiums.) This change has especially been telegraphed by Chip Smith, who is running on his “expertise” as an urban planner, and there has been commentary on the social media. With an 8-vote majority and with a Taylor-appointed Planning Commission, it would be possible to push through a massive rework of Ann Arbor’s zoning map. At present those residential zones are a tremendous frustration to those who would like to see dense development. We are about to run out of downtown. There is actually a move afoot at the County level to examine the role of single-family zoning in economic segregation, which in turn is based on a Federal program, Affirmatively Furthering Fair Housing. Here is the County flyer about it. The premise, on a national level, is that residential zoning has been devised to keep out the economically disadvantaged and racial minorities. So for “fair housing” we have to get rid of single-family housing. I don’t see that here. I live near two public housing facilities, some rental housing, and some historically black (single-family) streets that are holding on. In my view, single-family housing is simply how many of us would like to live. But it is a great impediment to development, which in Ann Arbor’s overheated real estate market, is where the money is. In principle, I don’t like to see any faction have the overwhelming power to do as they will. Some of Mayor Taylor’s agenda may have merit, but it should be argued out at Council and with reasonable citizen participation. I hope that Tuesday will see some rebalancing of City Council so that we can all deliberate on that future. UPDATE: In the August primary, one of Mayor Taylor’s majority (Jason Frenzel) was defeated. Chip Smith and Zach Ackerman were both renominated. Ackerman will be unopposed on the November ballot, so he will be on Council for the next three years. Jack Eaton defeated his primary challenger. The November ballot will have contests in the 2nd, 4th and possibly 5th wards. Here is the Ann Arbor News report and analysis of the results of the primary: Mayor’s Camp Could Lose “Supermajority” on Ann Arbor City Council. This entry was posted on August 6, 2017 at 10:10 pm and is filed under politics. You can subscribe via RSS 2.0 feed to this post's comments. You can comment below, or link to this permanent URL from your own site. Thanks, Vivienne, for sharing your views; it’s great to have this informed discussion / debate before the primary on Tuesday. Also thank you for getting out information on the election, the annarborvotes.com page, etc. Nice to hear from you. Thanks for all your work on the School Board. First Ward voters be warned – Mayor Taylor is counting on Frenzel holding on to his appointed seat to lead a dramatic increase in spending dedicated to “fighting climate change”. No one has said exactly what this would mean, or how success would be measured, if at all. But it’s clear that this WILL happen if Frenzel holds his seat, the groundwork for such spending is already being laid by Frenzel’s employer, HRWC, the Environmental Commission, and others. Expect a big funneling of public money to The Ecology Center, to HRWC, and to other Gang Of Eight political backers. Expect dramatic increases in fees for city services outside of and including water and sewer as mentioned above. For instance, the idea of pay-by-the-pound trash collection is being floated. There will be changes to the built environment as well. The anti-car crowd, of which he is one, is exploring closing downtown and near downtown streets to vehicular traffic. They are considering closing William and/or Washington, an initial study for closing William is reported to be nearing completion. Despite evidence to the contrary, the climate change fighters also believe that high-density high-rises are the green solution to housing. Expect dramatic changes to neighborhood zoning to allow tall buildings in former residential neighborhoods. This, too, has already been floated and praised by members of planning commission and city council. Yes, this is an important election. The amount of money being spent is higher than ever, and victory even by the thinnest margin will be held out as a mandate to implement the Gang of Eight’s peculiar brand of eco-fascism. Frenzel says fighting climate change is his #1 priority, and that annual city spending of $750,000 is not enough. So he believes in climate change, fine, but he also believes that one city in the world can spend it’s way to stopping it? This is not clear thinking in my book. It’s demented. This opens the door to justifying all sorts of tax and fee increases and budget re-allocations and zoning changes as “fighting climate change.” In the same way that trees retain water, we now pay for Forestry with our water bills. Leaps of logic to serve an agenda. No, thanks. We don’t need to be financing someone’s private mission to fight climate change, by any means necessary. Why don’t you start your own blog, Jeff? You have so much to say. I’m a forgiving poster about comments so I’ll leave all this alone. “The urge to save humanity is almost always only a false-face for the urge to rule it. Power is what all messiahs really seek: not the chance to serve. These posts are so valuable. I wish more people could see them. I miss them myself unless I happen to run into a link somewhere. Please let me know how to get notifications for updates. Marge, look at the right-hand column. Beneath the Pages, there is a button under Follow Blog via Email. If you click that, WordPress will send you an email every time there is a post. Thanks! I’m glad you find the posts of value. Just curious, Vivienne. Why no Third Ward endorsement from you? A longer discussion than I want to put in a comment. Oh.I thought we elected people to represent us. Thanks for posting. While I recognize that the Townie/Community wing proclaims that they aren’t against all development, I think that it’s fair to say that they are far more skeptical than the Mayor/Council Party. While scrutinizing development more closely, the Townie faction also typically supports increasing the size of the police and fire departments, and more infrastructure spending. These priorities seem to me to be, if not in contradiction, at least in tension. If the tax base grows more slowly than it would without as much development — where will the funds come from for more hiring and infrastructure spending? What departments, efforts (other than the train station) would be eliminated/cut? And, finally, what level of involvement should the city in addressing affordable housing and climate change? All good questions. Many of those trade-offs are made during budget discussions. The growth in the tax base is not solely dependent on new development – valuations increase for other reasons. (We’ve been annexing a fair number of township islands lately.) When you say “infrastructure spending” – that embraces many different uses. Roads mostly come from funds outside the city tax system. Sewers come from the Utilities fee system. So tax base is not automatically directed to infrastructure, though some amount is usually called for from the general fund. You should not assume that the “community” wing are all of one mind on any one subject. The answers to your good questions would vary with particular needs of constituents and with perspective and experience. I certainly don’t speak for all or any of them. Your last sentence needs a long discussion and exploration – those are huge questions, not easily answered. We may not agree on everything, but your thoughtfulness on the issues and highlighting the consequences that the minutiae of actual government is greatly appreciated and welcome. Keep on posting!